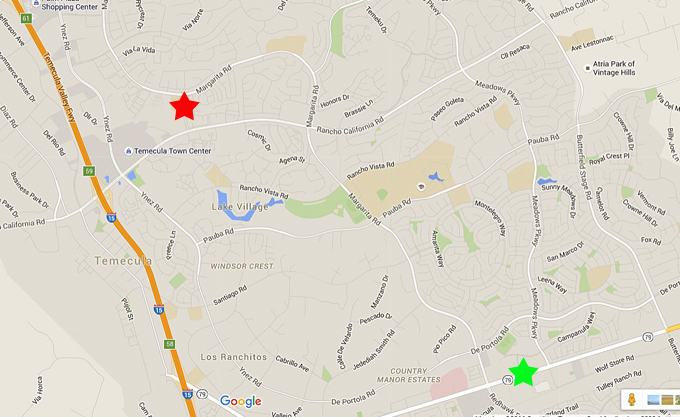 The incident began with the robbery of a business on Temecula Parkway (green star). A police pursuit ended with an officer-involved shooting on Moraga Road south of Margarita Road (red star). Update: The suspect Tuesday was identified by the Coroner's Office as Sam Newby, 49, of Temecula. The suspect in an armed robbery was killed in an officer-involved shooting in Temecula on Tuesday, authorities said. Riverside County Sheriff's deputies responded to the report of an in-progress armed robbery at a business in the 32400 block of Temecula Parkway, according to a news release. The report stated that a while male adult, armed with a handgun, had entered the business. Upon arrival, officers saw the suspect flee the business in a vehicle. They attempted to stop the driver, but he continued to drive erratically at a high rate of speed, ignoring traffic signals. At the intersection of North General Kearny Road and Calle Pina Colada, the suspect vehicle collided with a patrol unit. It continued and broadsided a vehicle at the intersection of Moraga Road and Margarita Road. The suspect vehicle came to a stop a short distance away on Moraga Road. When officers approached the vehicle attempting to make an arrest, an officer-involved shooting occurred. The suspect was pronounced dead at the scene. The occupants of the vehicle struck by the suspect vehicle were transported with minor injuries. Two officers were involved in the incident. Neither were injured and both have been placed on administrative leave per department policies. The involved officers' names will not be released at this time. The incident remains under investigation. Anyone with information regarding the incident should contact Central Homicide Investigator Dean at 951-955-2777.